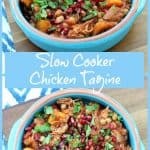 I’m still on a healthy eating drive so this slow cooker chicken tagine with sweet potato is just what I need, served with green vegetables and couscous or rice. 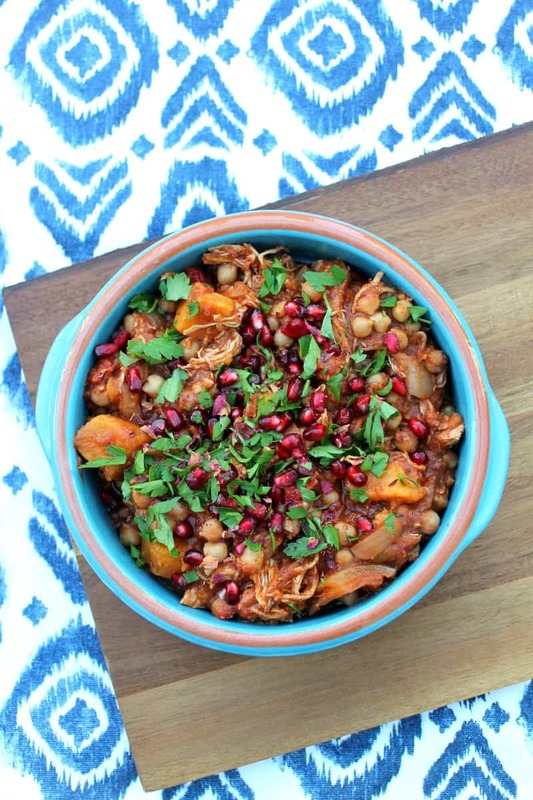 In winter or in summer, these Moroccan inspired flavours add a touch of spice to your mealtime. Don’t you just love it when dinner looks after itself? That’s the main reason I love to use my slow cooker. Throw in some ingredients and then later on return to a tasty meal, ready to eat. 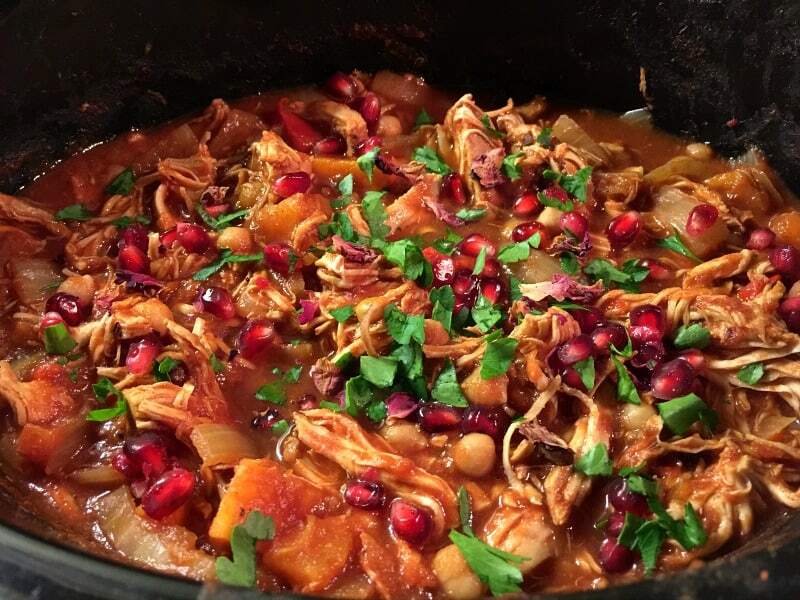 The chicken is so tender from the slow cooking, and the harissa, cumin and cinnamon add a delicately spiced flavour. I like to shred the chicken with a couple of forks before serving, so that the chicken serves more people. You don’t need a whole chicken breast per person when making a stew I find. 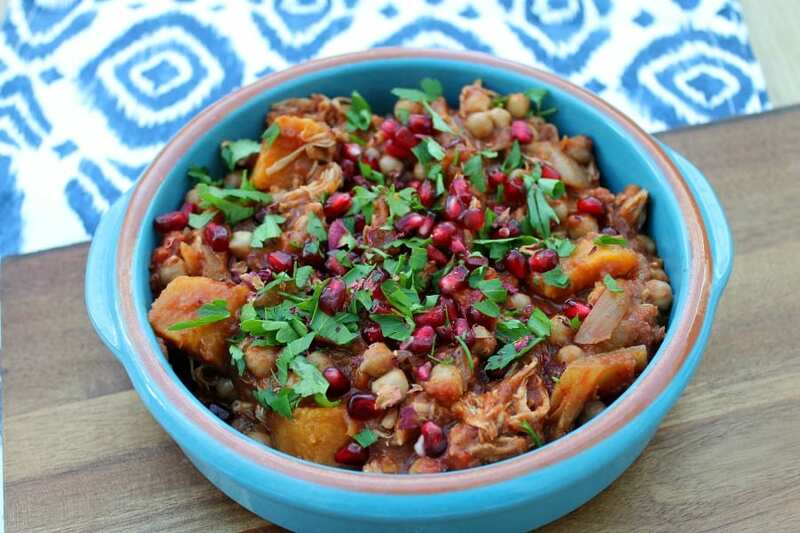 Chickpeas and sweet potato make the dish go further too, you could also add butternut squash if you have any, the butter soft texture and flavour goes well in a tagine also. 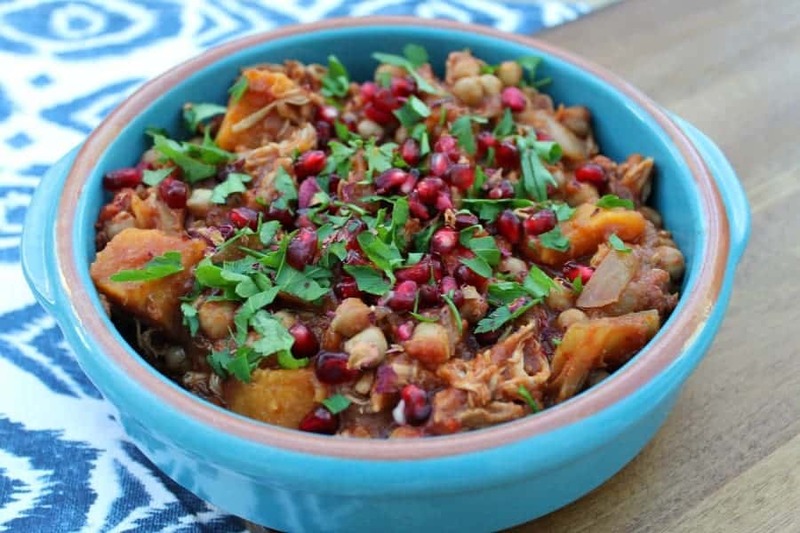 Garnished with pomegranate seeds, chopped flat-leaf parsley and dried rose petals, these add flavour and colour to the finished tagine, brightening up your plate. 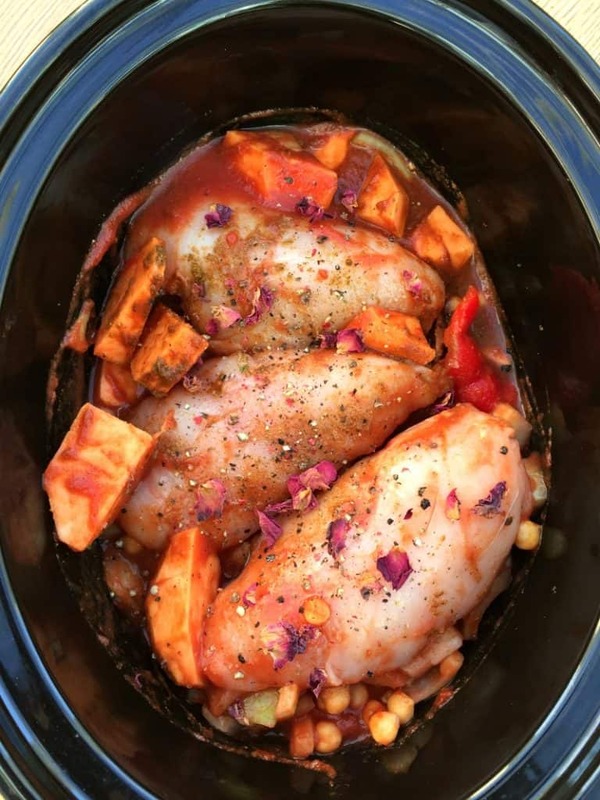 Before cooking, this dish already looks really warming and rich in your slow cooker pot, giving you an idea of what is to come. Shred the chicken and garnish before serving straight from your slow cooker. I really think midweek meals needn’t be boring when you can have something like this. Plus you can portion any leftovers up and have them for lunches through the week as well. 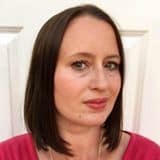 Traditionally a tagine is served with couscous, which takes only minutes to prepare by pouring over hot water, another time saver which is ideal if you want to eat as soon as you get home. Rice or pasta will also work too! Add the ingredients to the slow cooker pot. Mix gently to combine the sauce ingredients. 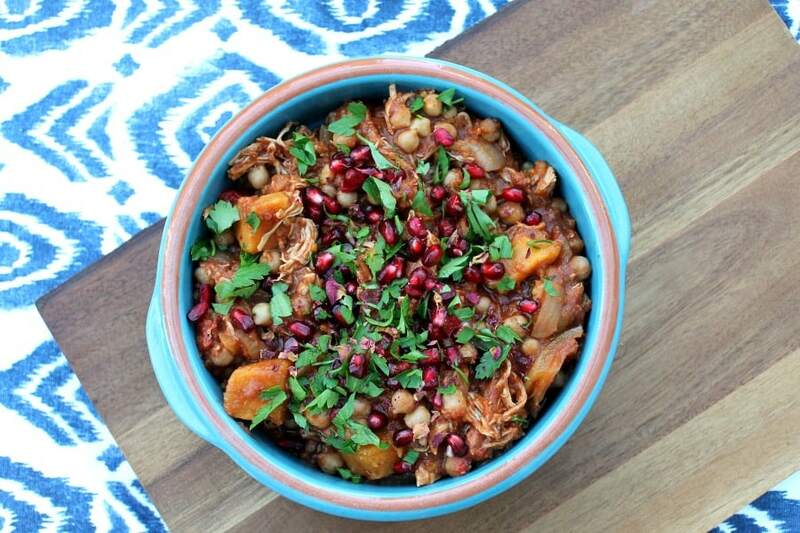 Garnish with the dried rose petals, pomegranate seeds and flat-leaf parsley, and serve with couscous or rice. Love how colourful this is! I love using my slow cooker. I’ve never made a tagine in it yet though. Will have to give it a go! Hi Alan, passata is available in the supermarket and is sieved tomatoes. You could use a tin of chopped tomatoes instead but it would have a different consistency. Harissa paste is also available in supermarkets, if you omit it you would lose part of the flavour so best to use it if possible and not replace. Hope that helps! 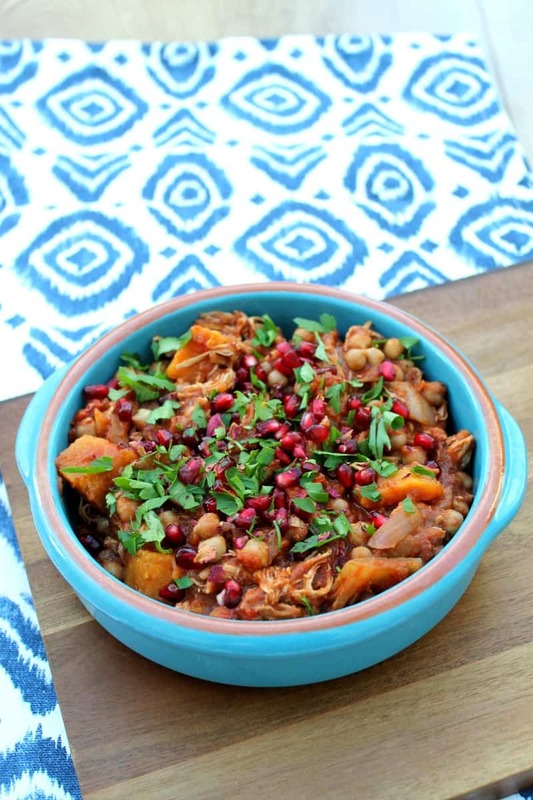 I love my slow cooker Lucy and this looks amazing. You’re so right, it’s great the way it looks after itself. Such a delicious dish. 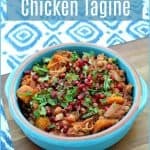 I’ve never really tried making tagine with chicken but this looks so tasty! !